I woke up to the alarm clock today at 4:00 AM. I had JUST fallen asleep at around 3:00, so I barely slept a wink last night. I didn't want to wake the kids, so I went into the bathroom and made coffee pot oatmeal (just heated water from the coffee pot, poured over quick cooking oats and added a packet of sugar. Then I topped it with a big glob of peanut butter. And I ate that with a fork. I had to get creative with breakfast at the hotel, because they didn't have a continental breakfast. I also had a cup of tea. Got dressed in my black and yellow UA outfit, and read e-mails and stuff until it was time to go. And when I say go, I mean, GO--to the bathroom. That's VERY important to do before a race ;) So after I had to go, then it was time to go--downstairs and outside, where Jessica, Renee, and Andrea were going to pick me up. We actually didn't have to drive far before we had to park--maybe a half-mile. Then we walked to the Brown's stadium, where the starting line was. After a few trips to the bathroom, and hanging around, we finally went to our corrals. It took a while to walk to the end, where we were going to start. Jessica wanted to start with the 4:40 pacer, who we met at the expo. I was nervous about going that fast, but there was no pressure to STAY with him, so we just started there. I was feeling discouraged already, and it was less than a mile into the marathon. When I got to the first water station, I walked through it, as planned, and then started running again, hoping to catch up with Jessica. I did see her for a few moments, but I could tell she was having a much better running day than I was, so I just let her go ahead. I fell back to a comfortable pace for me, and started thinking about what to do. I was not happy--I couldn't remember why I was doing this race, why I even wanted to run a marathon, or any of that. My knee was already hurting pretty badly. So, I made the decision sometime around mile two or three that I was going to run the half-marathon instead. The half and full ran together until mile 12ish, so I figured I would just follow the signs for the half at that point. I would have quit right then if Jerry and the kids weren't waiting for me at mile 12. Right as I made that decision, I felt much better. I even planned out what I was going to write on my blog about it, and I started thinking about how disappointed everyone would be; but I kept telling myself that I had to do what I wanted, not anyone else. I noticed a woman in front of me wearing a shirt that said on the back, "7 kids -80 pounds + 26.2 miles = priceless first marathon!" I thought that was really cute. She was wearing headphones, and normally I don't try to talk to people with headphones, but something made me say, "I love your shirt!" and then tell her that I was a fellow weight-loser. That was the beginning of about a 12-mile conversation. I learned her name was Tina, and we talked quite a bit--it was helping the time pass quickly, and for that I was really grateful! I was still planning on dropping out after 13.1 miles, but talking with her made the race bearable. It was EXTREMELY hot--I know a lot of you don't think 85 is hot, but they issued a "red flag". Which, according to the International Marathon Medical Directors Association, "This means that all runners should be aware that heat injury is possible. Those susceptible to heat are advised not to compete, and all runners are urged to slow their pace and hydrate adequately." I was walking through all the water stations, and keeping a pretty slow pace of about 11:20 per mile. At each station, I would drink Powerade, and then pour a cup of water on my head and down my shirt. Pouring the water on me helped with the heat a lot. When I got to the 12-mile mark, I saw Jerry and the boys. I was so glad to see them! The boys were holding their signs, and I gave them hugs (and sobbed, of course). I started running again, and was trying to decided quickly whether to leave the course for the half-marathon or go on for the full. I had called Rik (my Ragnar team captain) last night, and he was so confident in me and made me feel like I could actually do this--reminding me that it's all mental, and I really needed to think positively--so I thought about what he would say to me. He (of course) would tell me not to quit! And something about that, plus talking to Tina (she's next to me in that photo above), helped me to make the decision to stay on the course. Tina and I both mentioned at the 13.1 mile mark that we have a hard time after that point--that our energy and ability starts to deteriorate. We got kind of quiet and we were running on this DREADFUL part of the course. It was a really long strip of boring, full-sun road. At that point, it was hard for me to keep going. I started taking an occasional walk break (other than the water stations) to make my knee feel better. Somewhere after 15 miles, I lost Tina behind me somewhere, so I had to continue alone. I just kept running and taking short walk breaks. I saw a quite a few people who had collapsed and were receiving medical care. That made me nervous! I made sure to eat my Gu on time, and drink Powerade at every station. I kept my pace slow, and walked if I felt my heart or breathing get too high. At around mile 19, I saw a hot pink shirt waaaay in the distance in front of me--and I squinted to make out the purple shorts, and dark braided hair. It was Jessica! I started running as fast as I comfortably could at that point, because I really wanted to catch up with her. I was gaining on her, but it was taking a while, and I didn't know how long I could keep it up. She was out of shouting-reach. I saw a porta-potty up ahead of her, and hoped that she had to go (the odds were DEFINITELY in my favor, considering how much water she drank yesterday and this morning, haha). She did! She stopped at the porta-potty, so I slowed to a walk to catch my breath, and reached the porta-potty while she was in there. I stopped outside of it, and a man outside said, "Trust me, you don't want to go in there". I said, "I just saw my friend go in there--I'm going to wait for her!" Then I heard Jessica say from inside, "KATIE?! Is that you?" When she came out, we hugged and we both started crying (yes, crying). We had just reached 20 miles in, and we met back up. We were both relieved to be able to finish together, because we both needed the support at that point. We agreed to stick together the rest of the way. Both of us were feeling the pain, so we ran and walked as we felt like it. We walked through the water stations, and I kept my routine of the Powerade and dumping of water on my head. I think all the excess Powerade got to my stomach, because it started feeling very rumbly around mile 21. Like, I-need-a-bathroom-right-NOW kind of rumbly. Luckily, we didn't have to go far. That was the first time I'd EVER had to stop to go to the bathroom in the middle of a run. But my stomach felt better, so it was worth it. We could see the skyline of the city ahead, and I wanted to be there already so badly (that's where the finish line was). We went through a crappy part of town, and I saw these guys fighting in a yard. There were three of them, and two of them were throwing punches at each other. One of the guys had a baby in a stroller next to him, and the other guy started picking up bricks from the ground, and throwing them at the guy with the baby. I couldn't believe it! The guy went after him, and I just turned my head and kept running, because I wanted to get the hell out of there. About three miles from the finish, Renee and Andrea met up with us. I felt bad, because we were walking more than running at that point. My knee was hurting so bad it brought tears to my eyes with each step. I'm sure I was miserable company, but they stuck with us and actually ran/walked with us for the last few miles. I have to say, they were AMAZING to have there--Jessica and I had our own personal cheerleaders! I don't know of very many people who would do something like that for a friend, and I was so grateful to both of them. When we finally saw the finish line, I was searching the crowd for Jerry and the boys, but didn't see them. Jessica and I grabbed hands and crossed the finish line. Then I saw Jerry in front of me, and I kind of collapsed into him, crying and saying, "My knee hurts! It was awful!" I grabbed some pretzels, some dried fruit, water, and a banana, and started wolfing down the food. Then I stood in front of a couple of fans they had going with water spraying out. I started telling Jerry about Tina, when I said, "I hope that she finished... I want to go watch the finish line for her." And as soon as I turned around, she was there! She was just ahead of me, looking totally worn out, with her husband. I went up and hugged her and thanked her--if it wasn't for her, I'm sure I would have quit at 13.1. With Renee, who is the friend who got us both into running... she's amazing! The bling... the guitar in the middle spins around. Pretty fun! I went and sat in the grass and waited for Jerry to go get the Jeep. My legs hurt SO BADLY. I was limping and barely able to move. Mainly because of my knee, but both legs are stiff. On the way home, we stopped (because BOTH boys had to go poop this time, of course); and because I wanted a Cinnabon ;) Jerry ordered it, because I couldn't get out of the car, so he told the woman, "With extra frosting, because my wife loves frosting!" full marathon--1,038 female finishers; 194 finishers in my division. Not very impressive stats, I realize that. I was hoping I'd feel super accomplished when I was done, but for some reason, I don't feel proud, or happy, or excited about my results (yet). I just feel indifferent. And relieved that it's done. I never really had a time goal (although I would have liked to finish under 5 hours). I'm disappointed that I walked a lot at the end (I had only planned to walk the water stations), but I feel like I did the best I could in the circumstances. I am actually glad everything worked out the way it did--I am really happy to have met and run with Tina, and Jessica and I got to finish together. I'm "technically" a marathoner, so I can cross that off the bucket list. But for everyone that keeps asking if I'll do another? No! Hahaha, I have a whole new appreciation for half-marathons. They are MUCH more fun, they aren't as hard on your body, and they don't take as much time to train for. I also have a whole new appreciation for marathoners--I now realize how hard a marathon is! Congrats Katie! You are amazing. So proud of you for finishing!! I hope you have a massage scheduled for tomorrow!!! Don't discredit the heat! All time goals go out the window in heat like that. My 2nd marathon was in 85 degree heat, and I had bad knee pain too, and I didn't do NEARLY as well you (6:08, or 14:03 per mile). And it was horrible. But we DID IT. And maybe, in a few years, you'll forget how much it sucked and want to try again (preferably in cooler weather and without pain, because they aren't always that miserable!). CONGRATULATIONS. Well done Katie - HUGE congratulations on completing the marathon! I think your time and performance are irrelevant here - you overcame the biggest obstacle, and that was the mental challenge. I know what it's like when you decide on an "easy" way out, rationalizing, setting your story straight - once decided on it's very hard to break with that choice and you did it. You also listened to and respected your body which is so important in avoiding injury. Revel in your success - you did it girl! you finished a marathon!! That in itself is awesome. Great that they were able to keep your race open. I ran my first half marathon this morning in Green Bay, WI... it was the Cellcom Green Bay half & full. At 9:25 the race & medical director made the decision to cancel the race due to excessive heat injuries, medical personnel maxed out, and the temperatures... runners on the full course were picked up by buses and anyone who finished after 9:25am (7am start time) - doesn't get an official time. Luckily I was close enough to the finish when the called it so I was still able to make it to the finish, I just don't get an official time. 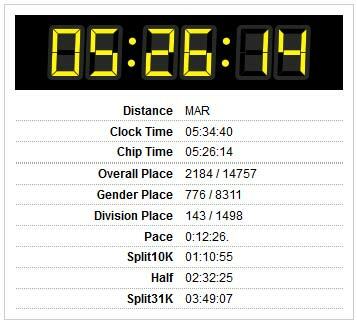 Great job on your first FULL MARATHON!! So proud of you! Congrats! So glad to read the report! You finished. Wahooooo!! That's awesome! Awesome! To go from running 1/10th of a mile to a marathon. I love your story and your blog. Thanks for sharing it with us all! What a great accomplishment! So happy for you! An awesome accomplishment and well-earned bling. Super hot day, knee issues and everything else you faced but you still managed to bring yourself 26.2 - that's amazing. Congrats, katie!! For gods sake I couldnt stop CRYING! Reading this to my boyfriend was just too much for me. Good job Katie I am so proud of you! Congrats!! I think you should be very proud of yourself for finishing. Congrats Katie! Your first (and only) marathon is something you should be very, very proud of. No matter what your time or anything like that. Bravo! Congratulations, Katie!!! I knew you could do it. You're amazing and should be proud of yourself no matter what!!! You comleted a effen' MARATHON so don't be too hard on yourself!!! YOU DID IT! So proud of you Katie. I can only imagine how hard it was, it's a helluva impressive accomplishment and one you should be proud of forever! LOVED your recap, as usual your writing is great...so honest and expressive. I get tears in my eyes thinking of how you must have felt when you were done. Did you cry too? I know you said you cried a few times along the route, but when you were done? Everybody said you would cry when you were done, but it doesn't sound like you did. You are indeed Wonder Woman! CONGRATULATIONS!! So proud of you! You are an inspiration and YOU DID IT!!!!!! Be proud Mama! Be proud! Congrats on finishing! That is HOT, so its no surprise you had to go slower than usual. Think about doing one in late fall when its cooler. It makes all the difference! Congrats on the finish! So the stats aren't what you hoped for but who the hell thought it would be 85 degrees in Ohio in MAY, right? Way to go. So happy for you! YOU. FINISHED. A. FRIGGIN'. MARATHON. Ice that need and do a little basking. You are now a Marathoner. Not too many people can say that. Forget the time, you should be ridiculously proud of yourself!! Congrats again! I am so proud of you. You can call yourself a marathoner and screw the time...what you should focus on is that you finished! That is an amazing accomplishment. Focus on the fact that you finished!!! Amazing! So happy for you and all that you have accomplished. Stand proud. Congratulations! I'm so glad that you were able to finish the marathon. I have been wondering all day about you! I actually ran my first 8 miles today in about 85 degree heat, so I can only imagine how difficult it was for you running 3 times as much. Well done! Incredible! I have done one marathon and probably will not do another, and I had a similar'ish experience. I trained well, but on the day of I just struggled. I have heard someone describe it as "my body just didn't show up". Like- it just wasn't clicking that day. For you it sounds like heat was a big factor. For me, I remember at mile 7 feeling like I just wanted to bail- and 7 miles was no big deal after all of that training! It was discouraging, but I am still proud that I (finally) finished. Bucket list, indeed! Way to go! Congratulations Katie!!! You prepared well and overcame the hardest part - the mental obstacles!. So, so happy for you. Now, rest up and go get that knee looked at! Way to go!!! I can't imagine how hard that was, way to go! Jut finishing is a big achievement! So proud, I don't think I could ever run that far, you should be happy!!! Congratulations, you are a marathoner. be proud, we are proud of you. Soooooo very proud of you, Katie! Young lady,you have many things to be proud of! And training for and finishing a marathon is one of them! You are a rock star!! ACongrats. You did great and listened to your body. The heat would've been brutal. Hope your knee calms done. You deserve a nice rest break. You did awesome! You finished! That's all that matters! Some people run the whole thing, but most don't. Don't forget that! Congrats Katie!! Congratulations, Katie! You should totally feel proud, You did it! I ran my first half in January on a hurt hip and knee. Training was difficult, it never got easier to run and I really hoped the adrenalin of the Disney run would get me through it. 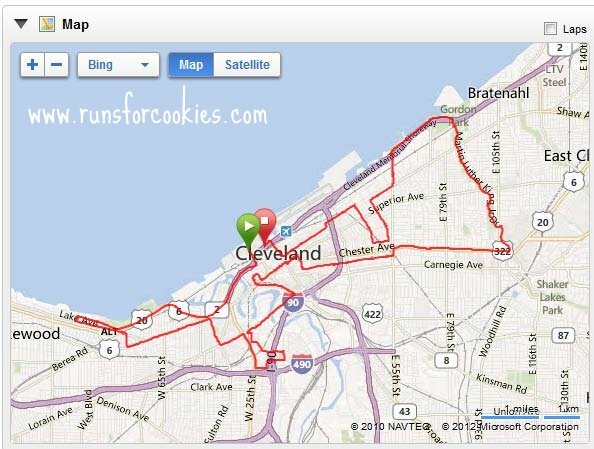 My husband ran it with me and I remember somewhere around mile 9 I was holding him and running with my eyes closed. As I crossed the finish line and I SWORE UP AND DOWN I would NEVER run another one again! I signed up for another one in November - I don’t' like to say I regret anything in life, because all things teach us. So I say, with regret comes redemption! I will redeem myself in November! CONGRATULATIONS on your finish. You are a marathon runner!!!!!!! I'm so proud of you and I don't even know you!!! If running a marathon were easy, everyone would do it. It's an amazing accomplishment. I bet tomorrow you are going to wake up and feel completely different about your marathon. Be proud, you didn't give up and you finished in a respectable time. Good Job!!! Bravo Katie! You have so much to be proud of. Congratulations and enjoy this great accomplishment. Peace, Lynne. Good job!!! I cried just reading about it. What an emotional day.. but you did it! Who cares about the time? Did you ever think you would run a marathon? Amazing. Truly amazing. You are such an inspiration. congrats!!!!!! i am soooooooooo proud of you!!!!! I just wanted to say congratulations that I think you are one tough girl! I can't even begin to imagine the mental battle you had with yourself to push through, especially at the half point. You rock! I've been waiting all day for this update!! CONGRATULATIONS! You really are an inspiration. I don't even know you but I'm so happy for you. Good for you for not quitting...3 hours, 5 hours, 9 hours...you ran a MARATHON! Congratulations on finishing! I'm so sorry you don't feel proud. I wish you did. I just completed a 5K on Saturday, and my pace was on par with your marathon pace! Whether you feel it or not, you did an AMAZING thing, and you are totally inspiring. YOU ROCK! You are a marathoner...display that sticker proudly! Thanks for inspiring me! You finished! You have much to be proud of - your completion of a marathon, your mutual inspiration with Tina (you helped her as much as she helped you), and your perseverance through pain and heat. Congratulations! Congratulations! You finished a full marathon so you are a rock-star in my book. Just remember that no matter how fast you go, a mile is still a mile and you ran 26.2 today. You are amazing! Congratulations on your marathon finish. Great job! Made me tear up! So exciting and definitely something to be proud of! Congratulations, marathoner!!! That's right around my first marathon time. I have a feeling you'll change your mind about this being your last marathons in the next few days (or perhaps months). Hang that medal somewhere you'll see it often. Chase wasn't the 4:40 pacer you mentioned, was he? What a huge accomplishment. You should be very proud. You did so great! I am so happy I was there to cheer you on! This blog post has me crying. I feel excited for you, happy!!! It may have been tough, but you DID it!!! Congratulations!!! Last year I was there cheering on a friend I met off twitter and it was one of the most powerful things I have ever witnessed. You are a ROCK STAR!!! I hope after the run you were also able to get those cookies that "you run for"...lol!! Again, congrats!!! Congratulations! I am super proud of you for continuing on even through the difficulties. I hope you have an easy recuperation. You deserve it!! Hope you are home and on ibuprofen and sleeping! Such a monumental accomplishment. Congratulations, Katie, your are a true hero. Your determination amazes me. I was checking the blog and Facebook all morning (I'm in Australia), desperate for an update! Since discovering your blog two weeks ago, I have been motivated to diet and exercise again, and start blogging again. I have walked twice and lost 2.7kg in my first week. You really are an inspiration - It's the way you look at things, it is just so positive. Thank you soooo much xox. I can't even BEGIN to imagine running for over 5 hours!! Amazing!! I hope that you realize that you should be proud! HOLY COW you finished, and your splits are solid! Way to go! Thank you for inspiring all of your readers! You shouled be proud happy and excited. You FINISHED!!! You rock girlfriend!!! I am LOVING your tie-dye head band! not only did you finish, but you did it at a totally respectable pace. It's not something to be indifferent about...you should be bragging about this! I really hope you feel better about it tomorrow or after the soreness goes away. Btw - I ran my first half today (the Colfax, in Denver). The knowledge that you were conquering your full at the same time motivated me to have confidence that I could do it, and I did! 2:15 :) It was only 50 degrees; if it had been 85, I would have FLIPPED out. All things considered, you totally held it together. Congratulations!! I had tears in my eyes reading this! You should be so proud of yourself for finishing today! I can't even imagine how mentally and physically though that must have been. Sorry it wasn't a great experience for you, but you had the courage to do it, which is more than most of us can say. You are an inspiration! YOU ARE AWESOME. I am so proud of you. The pictures of the signs, the boys...tears came to my eyes. I wish you could see yourself through the eyes of another. You are so beautiful, brave, inspiring, intelligent, and many other good things. YOU ROCK! Congratulations on sticking to your plan and finishing! You should be proud of your accomplishment. Like your weightloss, you had a goal and despite obstacles you achieved it. Your determination is one reason I enjoy your blog. Hold your head high Katie! you FINISHED! Some days are just bad run days. This may not have been your best but you didn't quit. You held strong and finished. Think of how proud your boys are of their mom. Their mom finished a marathon, trained hard and when she struggled, she overcame and finished. What an amazing example to them. And.. You FREAKING FINISHED A MARATHON!! Celebration time!! Wooo hooo!!! Congrats on completing it!! Way to tough it out! We are all so proud of you, Katie! I'm 20 years old, and I've never weighed more than 125 lbs, and I'm running a 5K in three weeks. I've been following your blog and you've made me realize that I have absolutely NO excuse to not run the entire thing, and next I'm doing a half-marathon in a few months. WAY TO GO KATIE!!!!! I am SO happy for you!!! All your hard work paid off! Now you do 26.2!!! Katie, you did it!!!! I had tears in my eyes reading your re-cap. I have felt everything that you felt today -- especially the RELIEF of being DONE!!! I know that this has not been easy for you, but I just wanted you to know that ever since reading your blog, your honesty, your candor, your REAL-ness, and your CAN-DO attitude have inspired me to start my own blog, and get back into running! THANK YOU. For your inspiration! And BIG HUGE CONGRATS!!! You are fabulous Katie, congrats on your effort - all that hard work paid off, & it's great you were so determined to stick it out. I'm sure you can see from all the comments that we are so proud of you!! It sounds like such a weird thing to say but I am so proud of you! You are my hero! I'm so glad that you found someone to talk to because I think/know you would have been dissapointed if you didn't finish! Although your time wasn't what you wanted it to be you still finished when you could have stopped and I think that walking more was a really good idea so you didn't really do some damage to your knee! I'm also glad that you have the friends you have! There are so many times I would have been lost without my friends and your friends seem like a HUGE support system! Last thing.....reading this brought tears to my eyes! As a mom I can only imagine doing the same thing by giving my kids a hug and crying! I love the signs they made! They are so stinkin cute! Also I have commented this to you before but from what I read about you and Jerry you remind me a lot of my hubby and I! We have been together since High School and he is my rock! He loved me when I was overweight and never cared if I lost weight or not but he has been by my side the last year while I have lost 80 pounds! I can imagine doing the same thing at the end of a race and just falling into him! You are amazing which is obvious by all the wonderful friends and family you have by your side! Congrats on what you have accomplished! Congrats Katie!! I know it was hard and you hurt, but you are an inspiration! I'm so glad you met Tina and didn't give up. You may not have impressive stats, but that is still something to be proud of!!! Good job! OMG Katie, well done you! I never, ever cry and I mean ever but reading your race report I had this alien water welling up in my eyes and this weird lump in the back of my throat that bloody hurt lol. I cried, for the first time in years! I wish you could bottle whatever it was that kept you going on Sunday! To start the race and feel bad from the get go but still make it to the finish line is amazing. Flipping eck, I felt like that at my last 10k and STILL struggled to finish. You completed a marathon Katie, that's 26. however many miles and the whole time you were either not enjoying it or were in pain - you're amazing Katie! I have to thank you. I logged onto your blog first thing because I didn't run last week (I hate it but need it) and I was listening to the little devil in my head telling me I don't need to run, I should give it up. Then I read your race report and suddenly that little devil cannot be heard. It's been drowned out by the one saying 'do it, achieve it'. Thank you Katie for your inspiration, your motivation (even though you may feel you lack it sometimes) and most of all for your sharing and giving so many of us the belief that we can achieve what we feel is truly impossible. Wow Katie. You got this even with all that pain!!! You are a huge inspiration to us all. Thank you. Cried through the entire post and every comment. You did it. All the justifying you were doing on the course would never have taken away the disappointment you would have felt had you stopped at 13.1. You KNOW you would have had to have another go at it. Now it's done, and like you said, you can cross it off the list, or you can go for it again knowing what to expect next time and look for possible better running conditions. Considering what the weather was like, this could have ended so differently because of the heat,(I'm thinking of the blog post by the woman that spoke about death and marathons), and I'm so glad that other than your bum knee, you're OK! That's MOST important. I know you're a pretty shy person, so you approaching Tina, even with her headphones on, was a Godsend. You needed each other. We are all so proud of you and all of your accomplishments. Think how proud 253 pound Katie would be to finish a marathon. Relish that feeling. So glad you met Tina and that she helped with the mental aspect of that day. Congratulations Katie, you did an amazing thing and should be so proud of yourself. Think of the lesson you've taught not only thousands of strangers who follow your blog but what you've taught your sons about working hard for something and following your dreams. You showed them if you don't give up, everything's possible. And for that, you should also be proud of yourself because it's obvious, your boys are VERY proud of their mama. Congratulations, Katie!! I was thinking about you all day and so excited to read your report!! You are such an inspiration because you stuck with it--even when it was harder than you thought it was going to be! Congrats Katie ON your Marathon,, your report brought tears to my Eyes. It brought back alot of memories for me for my first marathon last year . I had alot of the same experiences,, and have the same feelings now towards marathons . Love the Halfs,, but still not ready to commit to a full again !! Its kind of LIke child birth I guess,, gonna take some time. They are tough , Kudos to those that do them regularly !! Get some rest now,, remeber you can take a day off for every mile,, LOL,, I know you wont,, but the thought is nice huh :-) great Job My friend . You never know what you are going to be handed on race day and you played your cards in a way that got to the finish line of 26.2 :) I am SO PROUD of you and glad you did not bail at the 1/2 way point. If you can battle thru knee pain and heat, just think what YOUR NEXT one will be like!! Halfs are great too, we just finished our first half. Keith! It's Lynda's friend Linda! I need to know the story around how you started to run! It seems you've only just begun and you're already in the marathon! I'm beyond impressed and inspired! Congrats to you and you whole team! From Jerry and the boys, Tina,Jessica and everyone who supported you to reach this goal! It took a village but was so worth if! You have managed to entertain and inspire many as you reached the finish line! Proud of you and glad you completed injury free! What's next? I know your already plotting and planning! WOW!! What a strange feeling. I am all choked up and teary eyed reading this post!! You are an amazing inspiration!!!!!! Thank you for helping me believe in my self. 20 pounds down and 60 to go and you make me believe for the first time that I can actually do this. Thanks Katie. Katie - very well done and congratulations to you! You are such an inspiration to so many people, including myself! Soon it will sink in that you've run a marathon - even if you never do it again, you can still say "I've run a marathon", that is such a tremendous accomplishment! Can't wait to see what you've got planned next! Well Done!! You should be so proud of yourself. I'm just at the beginning of my weight loss journey and reading your blog has inspired me so much. I'm sure once the pain has gone, you'll realise just what an awesome thing you've done, this marathon was not only 26.2 miles, it signifies the end of your amazing journey you've been on. I just hope that I can do half as well as you - you've completely changed your life around for the better. WOW, thats a HUGE accomplishment! Congratulations and be soo proud of you.....I am!! Congratulations! You should feel proud. I hope you do! I'm thrilled to read your report. I've been thinking of a half marathon, but I you have confirmed my thoughts that a full marathon is a torture I never want to endure. You did fantastic and I'm SO glad you completed it. Congratulations! Congratulations Katie! It is an amazing accomplishment no matter how long it took you to do it! You are an inspiration and should definitely be proud!! Not a lot of people can say they have completed a marathon! I know I can say for all of your readers that we are so proud of you! You FINISHED 26.2 MILES !!! You are my HERO !!!!! :) Please rest your body and knee. I'm going to reread this whole entry.. I'm so impressed! I wish I had known you were there.. I would love to have met you in person! (I was there running my first half).. I'm also impressed you have your race report up so soon! I was so tried last night I could barely think! (I also traveled with my mom from Cleveland back home to Maryland). As a new runner (I've only done a 5k), this was absolutely wonderful to read! I have no intention of ever running a marathon, but hope to do a half one day. Coffee pot oatmeal - genius! Isn't it amazing how much running is truly a mental and emotional thing? We get lost in our thoughts and positive self-talk gets us through. Did you really have a 12-mile conversation? I can't even imagine talking while running (and I'm slooooowwww). Though I've never run with anyone yet. Thank you so much for sharing your experience! Cheers to your finish! Katie, Katie, Katie.... (sigh). What would the OLD Katie say if she saw the NEW Katie being bummed about her TIME?? She would say, "Shut the F*** up you crazy B****! You just ran a freakin' MARATHON!! A MARATHON!!" Lol. You have come SO unbelievably far. Congratulations on finishing the race! You had me in tears throughout this entire entry. You should be super proud of your accomplishment! Congratulations! And, way to go on finishing when you wanted to quit! It's amazing what we can push ourselves to do, even when we feel like we are at the end of our rope. You. Are. Awesome. I'm so happy for you that you finished! I was tearing up reading this. You worked so hard to get where you are and have accomplished so much. So what if you walked more than you planned. Your knee was hurting, so you did what you needed to. You have awesome friends and an awesome family. Congratulations! I hope you are resting up now. You deserve it! Wohoo, Katie!! Way to go - we all knew you could do it :) I love the pictures of you and your kiddos - they look pretty excited/happy for you, too! Rest up, and be proud of your amazing accomplishment! Nice work! And don't beat yourself up for your stats...you completed a freaking MARATHON! You should be so proud of yourself! Congratulations! You now belong to an elite club. The picture of your son holding the "Go Mom Go!" sign brought tears to my eyes, kinda chocked me up....what a beautiful example of health you are setting for him. I'm a very occasional runner...I just dipped under 200 lbs (again, but for the last time, I swear! ), and every time I put my running shoes on, I think of you. I only found your blog a short time ago, but you've been such a huge motivation to me. So that you for sharing. Thank you for running a marathon and blogging about it. It's on my bucket list, too, but I'm almost scared to say that out loud. Bravo, Katie! Oh, that's not at all what I was trying to do! I just meant that I was indifferent. I was hoping that I would feel hugely accomplished, but I don't really feel anything but relief yet. Maybe that will change in a few days! Congrats Katie! We all knew you could do it! You could have walked the entire thing and we all would have been proud of you for even trying! Katie - WEll DONE!!! You did amazing! Don't put yourself down...You finished a MARATHON! Thanks again for the inspiration. I got off track with my weight loss, put a few lbs back on but you've inspired me to get back on track today. CONGRATS! I am going to admit I cried a little reading this post. You did a great job and should be very proud of yourself for finishing a marathon! I hope some day to be able to run/walk a marathon. That is so far from now but you are such an inspiration to me. Congrats again, your are awesome! You did a marathon. You did. Amazing! did you ever imagine 4 years ago you'd be running a marathon. 26.2 miles. I"m amazed! Your my idol! Congratulations on such a fabulous job! congratulations on finishing it is an amazing amazing accomplishment! Amazing! Great work! You're such an awesome example! You did it! How awesome! I love how you do not hold back on your posts, you tell the truth and tell it like it is and that is why I follow you and respect you! Are you kidding? You don't need impressive stats. You finished a marathon, that's plenty impressive! Congrats!!!!!!!!!!! you are truly an inspiration. GREAT JOB!!!!!!!! I'm so glad you decided to keep going! Your ah-maz-ing!!!! I was at work, wondering how your race was going! I was sending positive thoughts your way!!!! I am so proud of you Katie!!! You are amazing! Congratulations on finishing the Marathon!! That is huge!! You are so inspiring and amazing!! Plus it is even more amazing that you finished with that kind of heat!! Way to go!! You've proved that we can do bigger things than we even think or imagine! YAYYY! You did an amazing job, it's about the journey not about the finish line! You should feel SO proud!! Amazing job at not quitting which to me correlates with your weight loss journey.....which is why so many of us read your blog. You INSPIRE us! Happy to have found your blog. Thanks for the advice. CONGRATULATIONS!!!!! and just fyi, i cried twice reading this post. :) Awesome job!!! You BOTH did it, old Katie and new Katie! The picture with your two beautiful boys illustrates that. In your weight-loss video, you said it "gave me my life back," and there's a shot of you, Jerry, and the kids. Your boys will never forget what their Mom did. You just taught them to NEVER QUIT. And you also learned--WE also learned :-) --that Help will find you when you need it. WOOHOO!!!! Congrats on your marathon. It is such an amazing accomplishment! I'm so proud of you for sticking with it and staying on track with the full. Now take time to relax and recover!!!! Congratulations. You finished and you are a marathoner. 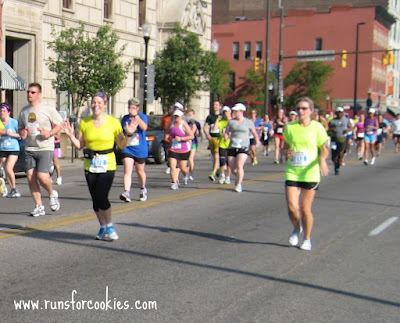 What I've learned in running marathons? No matter how many times you do it, their f'ing hard EVERY time. That heat was crazy and made it even harder for you. Great job! You did awesome! Congratulations on finishing and you should feel proud of every step (run or walk) that you took. YOU FINISHED A MARATHON!!! Wait I think you need to take a second and read this again...YOU FINISHED A MARATHON! You are amazing, and also really hard on yourself Katie!! I can't believe yu ran int in 85 degree heat too. you are a superhero! That is so hot, I can't even function in 85 degree heat! You are such an inspiration to me. I want to become a runner, but am scared. Tomorrow i will try again because you went from zero to 26.2!! Thank you for sharing your journey. Struggles and all. I found your blog about 2 weeks ago. I started reading about your weight loss and then your jaw accident and then I started back and your first blog entry and am reading each day by day entry. I just finished reading this entry and I know this is old news to you but I was nervous to read this post. I was nervous for you because I knew you were worried about the marathon. I am so glad you were able to complete it. One and done is a great motto. I can't wait to see what you do next.